Please correct the error(s) below and resubmit the form. Want your issues all in one place? 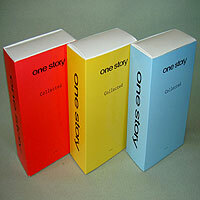 One Story Bookshelf Boxes hold up to 18 issues (1 year). Choose your color. To order individual back issues of One Story please click “buy now” next to the issue number and it will be added to your shopping cart. To order individual back issues of One Teen Story please click “buy now” next to the issue number and it will be added to your shopping cart.